Laying out the dimensions of a drop ceiling before installation is one the most important aspects of a suspended ceiling installation project. The time it takes to properly layout a drop ceiling will be time well spent, because improper layout may result in the finished product being less than satisfactory and not meeting your expectations. It’s very important to know exactly where light fixtures and other HVAC units will be installed to save time on installation of those fixtures. Good pre-conceptual planning is the key to a great drop ceiling. First, assess the room and get a good feel for the project. Look at the overall size and shape of the room. 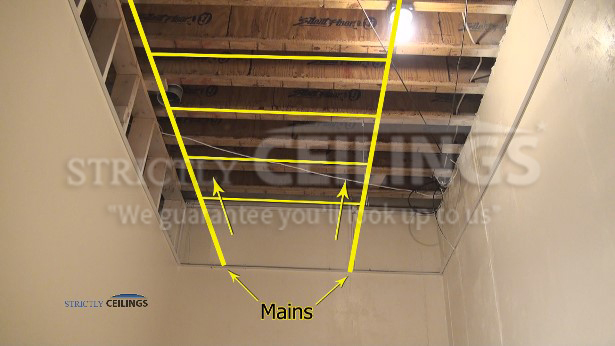 Assess the potential height of the ceiling and if there are any obstructions, like ductwork, in the way. Then, assess the structure above. Determine what type of material it’s made out of and which direction the structural members run. In almost all cases residential basements will have wood ceiling joists. If the structural members are wood joists then you will always install your wires and main runners perpendicular to the joist. Step 2 Figuring border dimensions for length. Once you have determined the above structure and the direction the mains will run, you then need to figure out the border dimensions of the grid. It’s best to draw the room out on a piece of paper and write all the dimensions of all wall lengths on it. Next, decide where and what type of units, like light fixtures, will be going in the ceiling. If they are can-lights then you want to make sure that you center them or place them over the area you are trying to illuminate. If your installing in a bathroom make sure that the exhaust fan is placed in an area that will fit between the joists. Once you’ve decided where the fixtures go, sketch them out on the drawing you made. If you are using a 2×4 grid system then you need to decide if you want to the run the tiles the long way in the room or turn them 90 degrees and run them the short way. 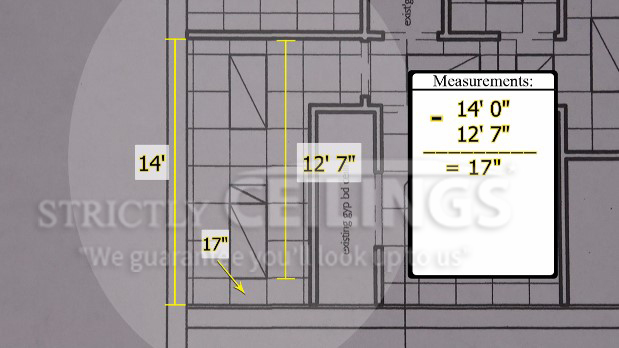 If you are installing a 2×2 ceiling grid system it is a little easier to figure the layout. Start with the length of the room and take the total dimension and deduct as many 2’ ceiling tiles as you can without going over the total amount of the room. Here’s an example. Make sure that this dimension works for your light fixtures. You don’t want a cross tee running where the light will go. 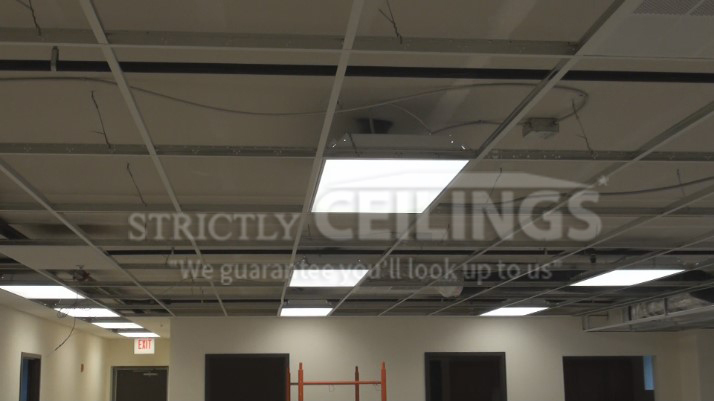 If you are using 2×4 ceiling tiles and you are running them the length of the room then you would do the following. Divide 5’5” in half = 2’ 8.5” is the border size for each end. Do the same thing for both the length and width of the room. Making the borders of a drop ceiling equal is always a good general rule and in most cases it works. However, you may have to make some minor adjustment one way or the other in order to accommodate fixtures and to avoid having very small borders. Small borders make the ceiling look bad because if walls are not straight they may go from 1” down to nothing and emphasize the flaw. This should give you a basic understanding of how to layout a drop ceiling. For more complicated projects and more in-depth learning requirements, try our advanced layout.